This is the track of the year... well, okay, maybe not quite 'track of the year' but it is certainly one of the top tracks out [this year]. The song goes on about Bruce Lee, transformers and other things from childhood memories. The video features the A-team van, King Kong, some flying pigs, and a transformer among other things. 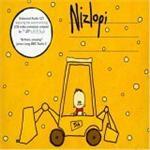 A big contender for Christmas number 1 the two lads who make up Nizlopi have created a masterpiece. The video for this song is also one of the top videos of the year. A must buy (even if it's just to keep the X-Factor winner off the top spot!) for everyone.